Aside from sewing and illustration, my other great love is PC gaming. One of my favorite games of all time is Borderlands 2, and I recently stared playing it again while my Juki was away getting serviced during the holidays. I fell in love with it all over again, and it sparked the need for a Borderlands 2 mini quilt. 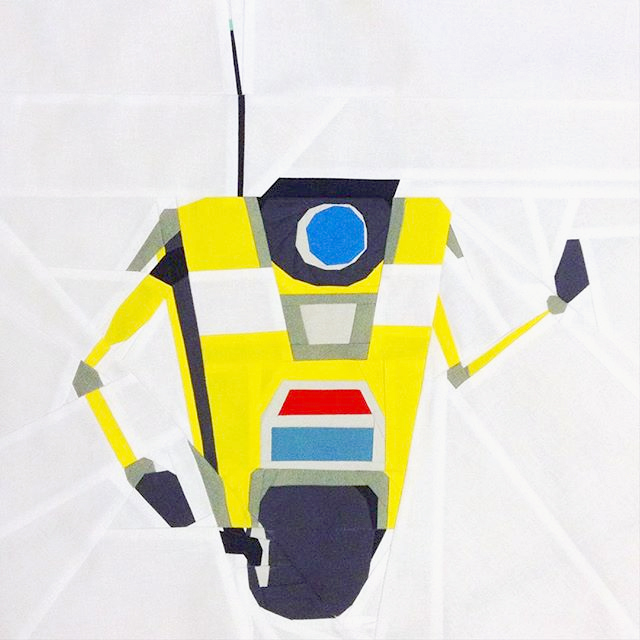 I designed an 18" square mini of Claptrap, the mascot of the series. High five, guys! I'm not sure how many quilters are also BL2 fans, but I thought I'd go ahead and share the pattern with you guys as a freebie. Click here to download the Claptrap FPP pattern. I'm planning on adding an embroidered speech bubble to mine before I quilt it. Claptrap has so many hilarious quotes. It'll be tough to choose one!